DAY 1: ARRIVAL AND ACCLIMATIZATION. FROM THE AIRPORT. 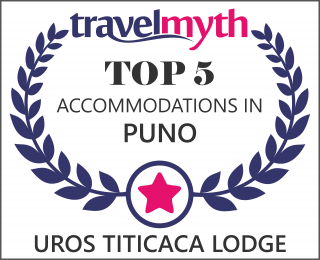 Reception at the airport in a private car from Manco Capac airport in Juliaca according to your flight and arrival time , assistance , arrival in Puno and transfer to Uros Titicaca Lodge , is located within the world's highest navigable lake . ( Approximate travel time 1 ½ hour). DAY 2: LAKE TITICACA – TOUR TO TAQUILE. After waking up at a suitable time, we will proceed to collect our fishing net that we put the previous day and see the diversity of native fish of Lake Titicaca; after breakfast, you will take a tour by the Lake Titicaca, the highest navigable lake in the world and will visit the island of Taquile, where we will have a hike, we appreciate the work of terraces, custom and tradition of its inhabitants, its way of life through its textiles, and taste a delicious lunch on the island. After enjoying the landscape of majestic Lake Titicaca we return to Uros Titicaca Lodge. DAY 3: TRANSFER TO PUNO / BUS STATION OR TRAIN. After breakfast at the bus station or train the transfer according to their departure times / farewell. After breakfast at a suitable time, will be transferred to the airport to board the flight to your next destination or you can take an excursion in route (toward the Juliaca airport), short excursion to Sillustani (depending on its availability of time), this site was a burial place of the pre-Inca cultures and Inca, which includes the famous Chullpas: funerary towers of circular, built in stone. Reach the 12 meters of height, at the foot of this site is the lake Umayo, a factor that increases the beauty of this mystical and beautiful place. After the tour we continue to the airport and farewell. 09:30 am Reception at airport Juliaca. 11:00 am Arrival to Uros Titicaca Lodge, registration, accommodation. 09:00 am Transfer and Departure by boat to the island of Taquile. 12:50 pm lunch in Taquile Island. 14:30 pm Return to Uros Titicaca Lodge. 15:30 pm Arrival to Uros Titicaca Lodge. Day 3: TRANSFER TO PUNO / BUS OR TRAIN STATION. 08:30 am Transfer and tour en route (toward the Juliaca airport), short excursion (depending on its availability of time), or activities around Uros Titicaca Lodge / Farewell. Transfer from airport - Puno - Uros Titicaca Lodge - Puno. Transfer Uros Titicaca Lodge - Puno. Transfer Uros Titicaca Lodge - airport (additional cost). TOUR PUNO – SILLUSTANI – AEROPUERTO O VICEVERSA (adicional cost). For day trips on to the Lake Titicaca, you generally need very little, but the following items are advisable to carry in a day pack and /or wearing them on.